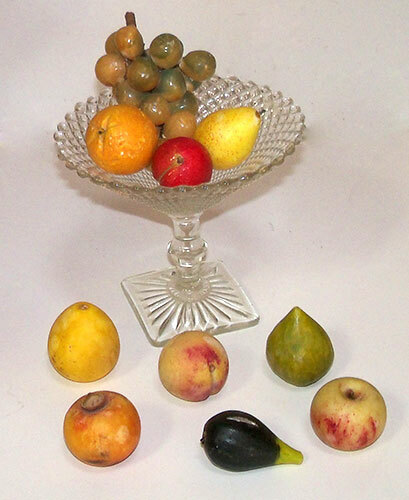 Presented here, a wonderful selection of 6 miniature Stone Fruit in a glass compote. The selection includes a pear, kumquat, peach, apple, a green fig and a black fig. See below. In addition, we have several other pieces available to add to your Fruit Salad . 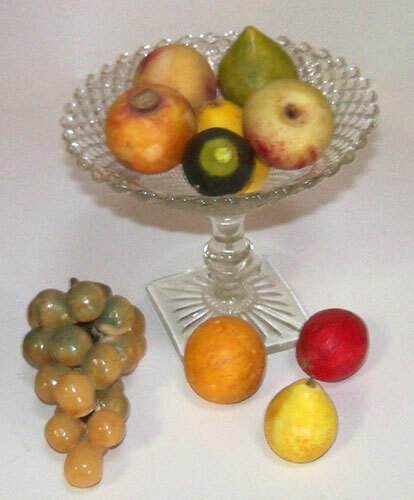 . . an Orange, a Pear, a red Plum and a bunch of grapes (wood stem) that are being sold separately. The Compote is 5-1/2 inches in diameter and 5 inches tall. All of the fruit is in very fine condition as is the Compote. The surfaces are nicely oxidized and the colors are bright. These are old pieces that have been in my own collection for years as I have added to the collection a piece at a time as these miniatures are not all that easy to find, especially in this condition. $365.00 for the Compote and the 6 fruit.